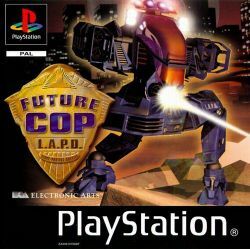 Future Cop: LAPD is a third-person shooter published and developed by Electronic Arts and released first for the PlayStation, then Mac OS and Windows. It was originally supposed to be a sequel to the popular Strike series of games. The final cutscene of Nuclear Strike includes a trailer for the next game in the series, Future Strike, including shots of a mech robot called "Warrior". Future Strike was never released, but that development of the game evolved into Future Cop: L.A.P.D., which features gameplay similar to the previous Strike games and a mech robot like the one seen in the Future Strike trailer. In the game, players assume the role of a pilot for the X1-Alpha, a robot designed to fight in the "Crime War" in Los Angeles in the year 2098. The X1-Alpha is a police vehicle that can transform between a fast, hovering pursuit vehicle, and a slower, full-fledged combat mecha. This page was last edited on 30 May 2016, at 05:21.